A clutter free living room presents a special set of organizational challenges. Having places to store things is key to a clutter free living room. The living room is, after all, home to some of the biggest, bulkiest objects you own. You have your basic sofa, chair, end table, and coffee table. Note that none of these pieces usually has storage. Where do you put the remote? Magazines? Newspapers? Paperwork? Headsets, etc.? You get the drift. Most families just carry the stuff they need or are working on into the living room, and then leave it there (of course!). This is precisely what you don't want. Here are some easy ways to create more storage, from least to most expensive, for a lively - and clutter free - living room. The solution to living-room clutter is giving the family a place to put their things so they can keep them where they use them. Incorporate attractive baskets into your decor. Choose furniture with hidden storage, such as ottomans, benches, etc. Choose furniture with built-in storage such as armoires, hutches, and bookshelves, as well as coffee tables or end tables with baskets, shelves, or drawers. 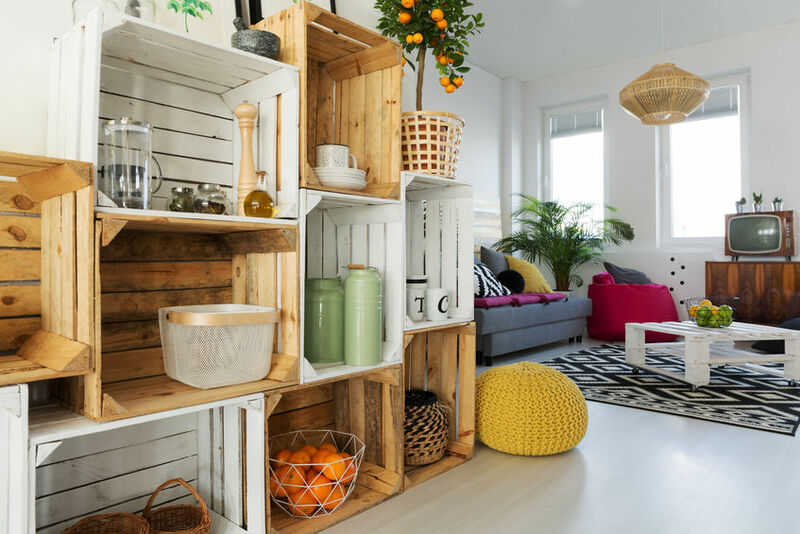 Invest in custom-designed storage units, or create you own DIY version with open crates that serve as shelves. Store the small stuff in Shaker-style boxes, decorative bowls, colorful cookie jars, and wicker baskets. Once you've arranged some storage, now you have to decide what goes where - and how to keep it there. Reading: Store books, newspapers, or magazines in baskets, on shelves under the coffee table or end tables, on bookshelves, or in attractive magazine racks. TV: The problem is not so much where to put the the as where to keep the remote, games, and other accessories that go with it. If you use them a lot, just leave them on a tabletop. But always put them in the same place. Sewing: Even if you don't sew, per se, you probably mend and stitch buttons. If you keep your sewing kit handy in a cabinet in the entertainment center or hutch, you'll be much more likely to actually do those minor repairs. Toys and games: Many wooden toy chests are attractive enough to grace your living room. (Make sure, however, that any chest you use for toys has supports that will hold the hinged lid open in any position. Many children have been injured by lids crashing down on them. Benches with storage underneath are another option, and they can neatly camouflage an entire battalion of G.I. Joes. Otherwise, group toys by type (LEGOs, Barbies) in plastic containers, and stack them neatly on shelves or in cabinets. Allow little ones to pull out only one container at a time. In addition to these organizational groups, consider giving each member of your family a personal place to stash stuff. It's helpful to locate these personal places beside each person's favorite spot to relax. Now with places to do things, and to put those things out of sight when done, your family can be an active part of your lively, organized living room!